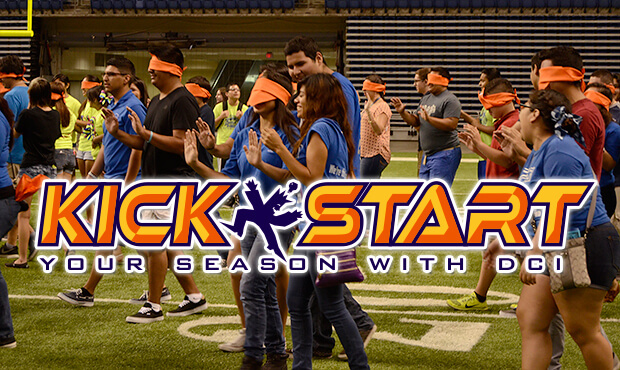 Students take part in an interactive Kick Start activity on the field of the Alamodome last Saturday in San Antonio. Before the corps took the field in San Antonio last Saturday, the Alamodome played host to a special leadership workshop that encouraged music students to pursue excellence in performance and everyday life. "This is an opportunity for groups of students from bands and organizations to come into a drum corps show just a little bit early and experience the psychology and dynamic of teamwork," said Fran Kick, creator and presenter of Kick Start Your Season with DCI. This educational event series, specifically designed for drum corps audiences, is designed to show students what commitment to excellence can mean when everyone works together. Each interactive session seeks to inspire students to reach new levels of responsibility, discipline and self-awareness, all while nurturing the core values that will help them succeed in life. "A lot of times we'll talk about this being a leadership workshop, but we really focus on the fact that it isn't just all about the leader," said Kick. "It's about the relationship between the leader and the follower, and how the two work together to make things happen." Admission to a Kick Start session is free with the purchase of a ticket to the corresponding DCI Tour event. Students come early for an afternoon of leadership education, and stay for the show to see some of DCI's finest ensembles up close and personal. Kick Start sessions are offered at the following events: DCI North Alabama Huntsville, AL Friday, July 25 DCI Atlanta Southeastern Championship Atlanta, GA Saturday, July 26 DCI World Championship Finals Indianapolis, IN Saturday, August 9.